LEARNING OBJECTIVES: To develop your understanding of how archaeologists use data (not artifacts) to infer large-scale patterns in human behavior. The form and method you will follow in this report is how scientific knowledge in many disciplines is created worldwide. Using the archaeological dataset provided below, conduct a quantitative analysis to answer a research question of your choosing. We will discuss the types of questions that may be answerable with the data. Using all of the 8 sections below, make a scientific argument that relies on the results of your analysis. Your argument should be no more than 4-6 double-spaced pages including text and figures. Write one paragraph for each section below. Label each paragraph by section (e.g., Introduction, Background, Expectations, etc.). This assignment requires using only the dataset provided below; no outside research (e.g., citations) is necessary. Please include your research question, hypothesis, a brief statement of your results, and some general information to orient and excite your reader about your investigation. Don't hesitate to use easy to follow sentences like, "The purpose of this report is to..." or "This report considers x (independent variable) to better understand y (dependent variable). I make two arguments: first...second..."
Your research question involves only the data provided below. A simple way to state your question is: "What was the influence of x (independent variable, such as drought severity) on y (dependent variable, such as the percent of rooms abandoned during the period of study, 1200 to 1450). 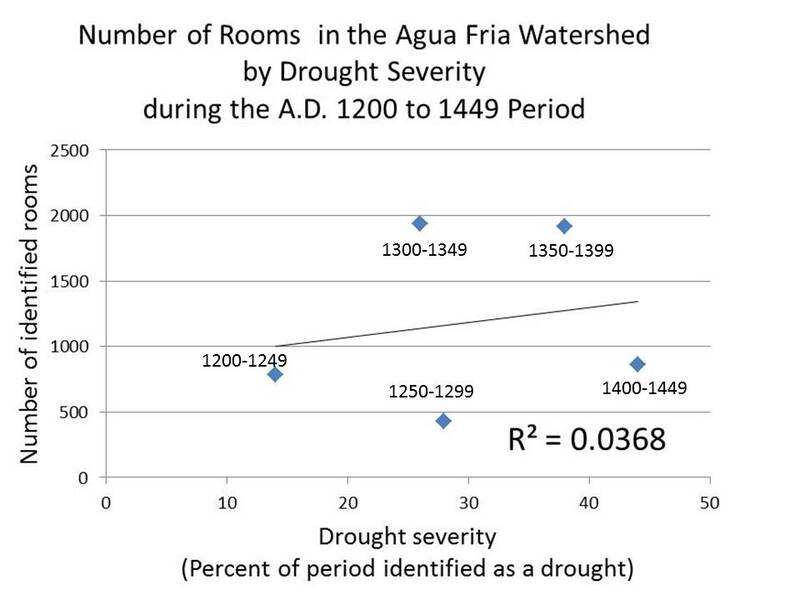 Thus, a reasonable research question is, "What was the influence of drought severity on changes in the percent of rooms abandoned during the 1200 to 1450 period?" Another research question is, "What was the influence of drought severity on changes in the number of archaeologically identified rooms." I recommend you select one of these two questions to investigate. Tell the reader why your investigation is important to our understanding of the past. Identify the spatial and temporal information associated with your study area. Please identify and define your your dependent variable (what you are trying to explain) and independent variable (what you think might explain variation in your dependent variable). Define what these variables represent. For example, if you're using the number of archaeologically identified rooms as a dependent variable, then this is an indicator of relative changes in human population levels. The percent of each 50-year interval identified as a drought is an indicator of relative differences in the dryness of each period. The greater the dryness, the lesser the agricultural productivity. The purpose of the background section is to give the reader sufficient information to understand your research question and to situate your research in the context of other similar research. In this assignment, however, you do not need to investigate the scientific literature on the potential relationship between your variables. Make your best guess on why the question and answer might be important to the scientific community and the public. Don't forget to tell the reader what a watershed is and what a drought is. For your information, the people living in the place during this period did not have domesticated cows, oxen, etc. to assist with farming. Identify your hypothesis. Describe what you expect to find in the data if your hypothesis is supported/not supported. What kind of relationship do you expect (positive, negative, or no relationship)? Sample sentences you can use: "My hypothesis will be supported if I find..." My hypothesis will not be supported if I find..." "I expect that as x increases, y will increase." Discuss why it is reasonable to expect a relationship between your variables (e.g., why would population density affect abandonment rates?). Avoid investigating relationships between variables in which there is no reasonable mechanism of influence of the independent variable on the dependent variable. 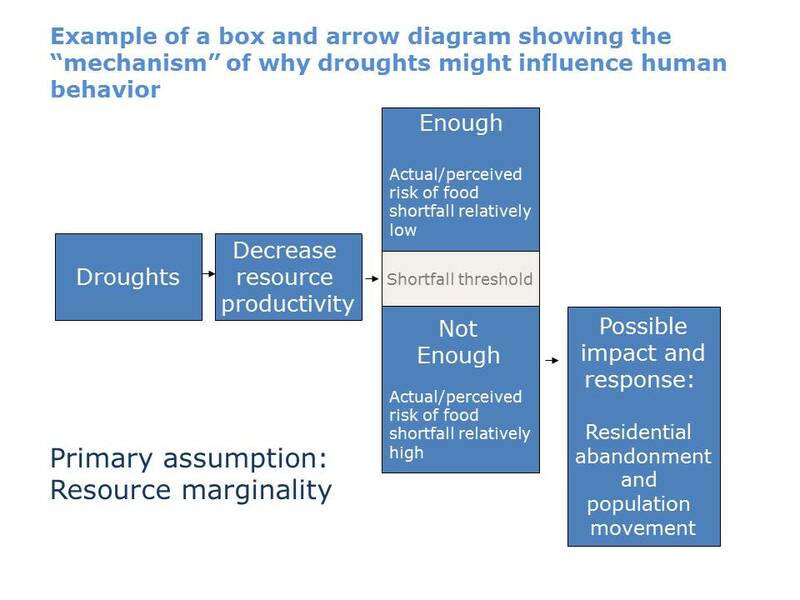 For example, it makes no sense to investigate the influence of population density on the percent of a period identified as a drought because atmospheric processes explain variation in drought frequency, not population density (at least in the past). Create a box and arrow diagram that identifies the relationship between the variables and the direction of assumed causality. Insert the figure into your text in this section. You will likely need at least one box between your independent variable (the left-most box) and your dependent variable (your right-most box) to explain the relationship between the variables you are investigating. Click here to see an example of a box-and-arrow diagram that presents a mechanism. Please don't duplicate this figure in your report. For a better understanding of causal mechanisms, watch the video at the bottom of this page (click here) and look at the spurious correlations on the page. Describe how you conducted your research. Please provide enough information so the reader can evaluate whether or not your methods were sound. Use professional, credibility-building language. This is not a diary of what you did (e.g., First I figured out how to make a scatterplot, then I...). Restate your independent and dependent variables. Remember that if your dependent variable does not vary you do not have an appropriate research design. For example, it doesn't make sense to investigate the influence of a subsistence system (independent variable) on the size of a watershed (independent variable) because the size of a watershed does not change over our 250-year period of study. Thus, it is not a dependent variable. 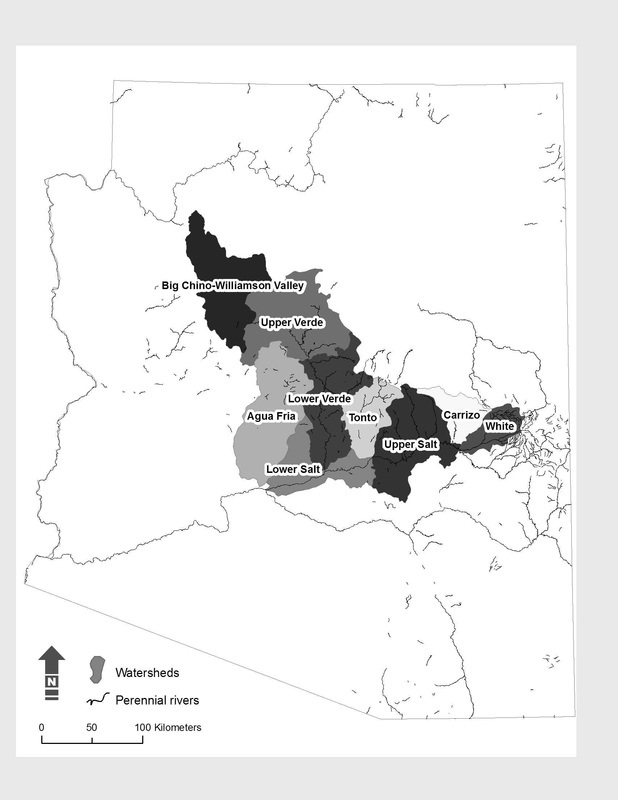 Furthermore, there is no plausible mechanism why a subsistence system would influence the size of a watershed. Explain where the data came from (hint: the answer is not "from our class website" and not "from your professor."). Where does archaeological data come from? What have you learned about this and our discussion of archaeological knowledge creation? Either here or in the Results section you will need a paragraph explaining to a reader how to interpret the measure of association you are using: r. In others words, what is r and what does it provide information about? Describe the results of your analysis (note: placing scatterplots in your report without explanation is not a description of your results). Support these results with data tables and/or scatterplots and describe and interpret what the reader will see in the tables/scatterplots. Are the relationships in the scatterplots weak, moderate, or strong? Note that both the correlation coefficients and the distribution of the points around the line matter. Use the specific working provided in the initial activity to interpret your scatterplots. The Results section should start with text, not a figure. All tables and figures should be named (e.g., Table 1. Number of Archaeologically Identified Rooms) and referred to in the text (e.g., "see Table 1). Include only the data you used to answer your research question. Note that a table is different than a figure; use the correct word. Your results will include 6 scatterplots, one for each watershed, and the correlation coefficients (r or r squared) that describe the statistical relationship between your independent and dependent variable in each watershed. The relationships may be presented in a single scatterplot, but that is more difficult to produce and can be more difficult to understand--but, your data presentation strategies are up to you. The x and y axes should be of equal length so the relationship (or lack thereof) is not distorted. Tell the reader of your report to what extent the relationships identified in the scatterplots support or don't support your hypothesis and answer your research question. For example, if only 1 of 6 scatterplots supports your hypothesis, then you have little to no support for your hypothesis. If 5 of six scatterplots support your hypothesis, then you have strong support for your hypothesis. Identify the relationships you found in each watershed as weak, moderate, or strong. Remember that hypotheses are not "true" or "false," "right" or "wrong." Hypotheses are supported or not supported to different degrees by the available evidence. Thus, your hypothesis will be supported, weakly supported, moderately supported, or strongly supported. Please tell the reader what the significance of your findings are and why you think your results are the way they are. For example, why did the strength of the relationships vary by watershed? If you look at demographic or environmental information (i.e., watershed size, modern average annual discharge of the largest river, the primary subsistence method, and modern average watershed precipitation levels) you might find some information that will help explain your results. Does your study have any implications for humans today? Have someone you trust read your report and tell you what they don't understand. Revise every sentence and your study until they understand it. The report must be written to make sense to people that have not attended our class. Many researchers find it easier to write their report AFTER they have worked with their data and conducted their empirical research. You will need to use a simple correlation analysis to understand the statistical relationship between your variables. You can do this in Excel. Find a tutorial on the internet. You can search on correlation analysis or "how to make a scatterplot in Excel." It's important in many careers to be able to teach yourself how to do different kinds of analysis. Include a trendline and the r or r squared statistic in your interpretation. A scatterplot looks like the figure below. The y axis is for your dependent variable and the x axis is for your independent variable. Label the x and y axes and all data points. 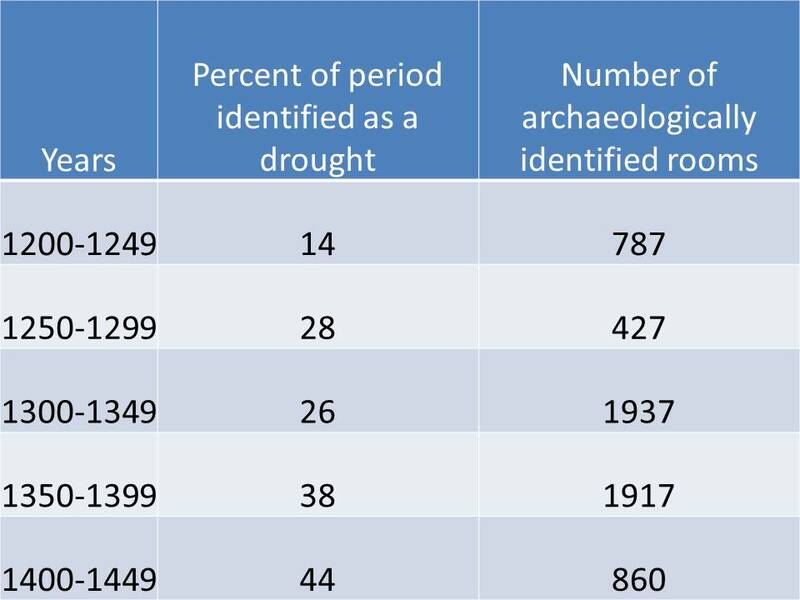 The "Number of archaeologically identified rooms" is an archaeological indicator of population levels. A room at this place and time housed between 0 and 4 people. Archaeologists use material indicators to determine past population levels (and many other things). If you divide the "Number of archaeologically identified rooms" by the "Watershed Size, Square kilometers" you will have an indicator of population density in a watershed. Thus, in the Agua Fria watershed during the 1200 to 1249 period, there were 0.12 rooms per square kilometer. In the Lower Salt watershed, there were 1.83 rooms per square kilometer. The Lower Salt watershed was much more densely populated than the Agua Fria watershed. To display your scatterplots, insert a table into Word and paste each scatterplot in a cell in the table. You will mostly likely need to present 6 scatterplots, one for each watershed. Each watershed and associated scatterplot provides evidence to evaluate your hypothesis; there is no reason to ignore the extensive spatial data you have to answer your research question. The data you use will be determined by your research question and hypothesis; however, you will need to use all the watersheds in your analysis. If you are having trouble, I recommend you analyze the relationship between the percent of period identified as a drought and one of the demographic variables. Click here to download the data in Excel format. Map of watersheds in study area in modern-day Arizona. This is the data in Excel that was used to produce the scatterplot to the left. Set up the data in Excel as in the table above. I recommend excluding the Years column if this is the first scatterplot you've produced. Highlight the data and column headings and select INSERT and select a scatterplot. Exceeds expectations: All eight sections are present and identifiable. Each section contains exactly the information required. The study is understandable and "makes sense" and contains minimal to no grammatical and spelling errors. Scatterplots are accurately developed; each figure has a title and all axes and data points are clearly labeled. The study contains original interpretive insights and is a pleasure to read. Meets expectations: All eight sections are present and identifiable. Each section contains most of the information required. The study is understandable and "makes sense" but contains several grammatical and spelling errors that cause confusion. Scatterplots are accurately developed and understandable but are missing some of the required elements (e.g., titles and labels for axes and data points). The study contains few original insights. Does not meet expectations: All of the eight sections are present and identifiable but some sections do not address the required information. The study is difficult to understand due to grammatical and/or spelling errors. Scatterplots are understandable but hastily prepared with some elements missing. Little attempt to interpret the data, results, or articulate the implications of the study is evident. Other Most of the eight sections are present and identifiable and some of the required information is present. The study is difficult to understand due to grammatical and/or spelling errors. Scatterplots are hastily prepared and missing requested elements. No attempt to interpret the data, results, or articulate the implications of the study is evident.